Rain jackets are an essential piece of equipment for outdoor enthusiasts and casual walkers alike, but faced with so many options trying to buy the right one can be daunting. This guide hopes to introduce some terms you'll come across in product descriptions, the different types of rainwear construction and a few technical features to think about. Understanding the terminology associated with rain jackets will allow you to identify what degree of protection a product has and so decide which is the best option for you. 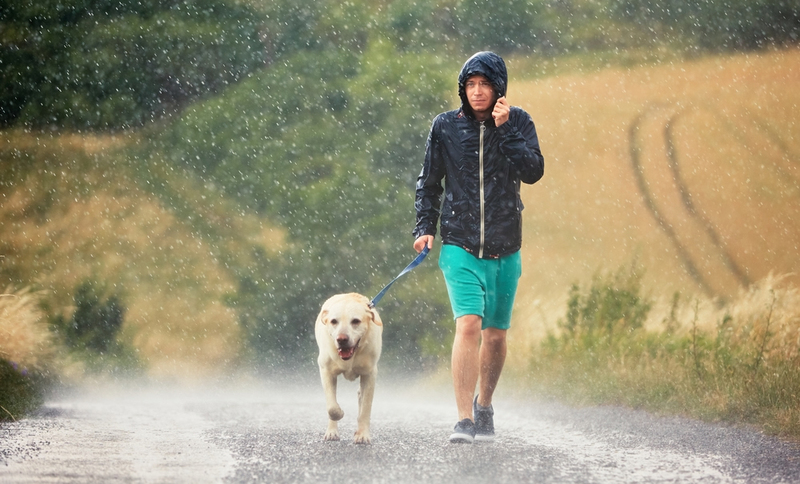 Water-resistant clothing can handle light-medium rain for a limited amount of time. These products will be finished with a water repellent coating (called DWR), but are not 100% waterproof. Although these products will also give some protection from the wind, they will not hold up in a storm - they're designed to be lightweight and compactable. 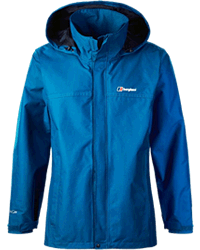 Waterproof clothing can withstand substantial and continuous precipitation without letting any water through. Any rain jacket that is waterproof will also be windproof. These jackets are made to stand up to the elements. DWR (durable water repellent coating): Nearly all outerwear has an added DWR finish that causes water to form beads and roll off the surface of the jacket. Although often overlooked, DWR requires maintenance after purchase because it wears off over time. You know that you need to retreat your jacket when water stops beading on its surface. 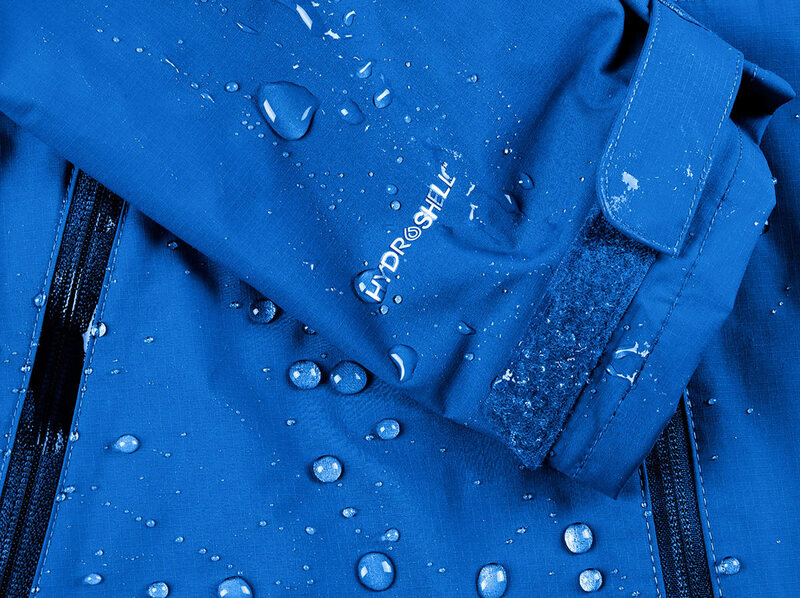 Breathability is a key factor in choosing a rain jacket. This is the transfer of water vapour - produced by the body in the form of sweat - through your clothing. A less efficient transfer will allow the build up of moisture that results in a 'clammy' and cold feeling, while a more efficient transfer will leave the skin feeling dry and comfortable. The more strenuous the activity, the greater the demand for breathability will be. Having been the focus of rainwear manufacturers for decades, there has been a continuous push in development of waterproof/breathable materials. As a result, Gore-Tex® is no longer the only option, with brands such as eVent, Hyvent and Dry.Q performing to a similar standard. Laminates: Constructed out of expanded polytetrafluoroethylene (ePTFE), polyurethane (PU) or polyester, membranes are very waterproof while remaining highly breathable, durable and lightweight. However they are more expensive than coatings. Coatings: Constructed from different formations of polyurethane (PU), coatings have good waterproof performance and are breathable and durable but are not as good as laminates in these respects. However, they usually weigh less than laminates and come at a lower cost. Laminated membranes and coatings are protected within additional layers. An outer layer will provide durable protection against wear-and-tear, while the inner layer will protect against body oils and general abrasion. This basic structure can be constructed in a three different ways; 2-layer; 2.5-layer and 3-layer. The membrane or coating is attached to the inside of the outer layer to form a single piece of material. An inner layer then sits behind this to protect from internal abrasion. This design is often found in urban and travel wear, as it tends to be quiet when you're moving and is moderately priced. 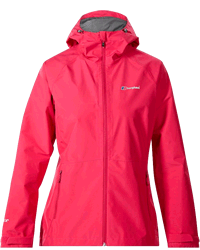 However, it falls behind 3-layer rainwear in terms of breathability, weight and waterproof performance. This design has a durable outer layer with a laminate or coating applied within the first layer. A final protective layer (a “half layer”) is placed over the laminate. These designs are generally more packable and lightweight than 3-layer approaches and are less expensive. 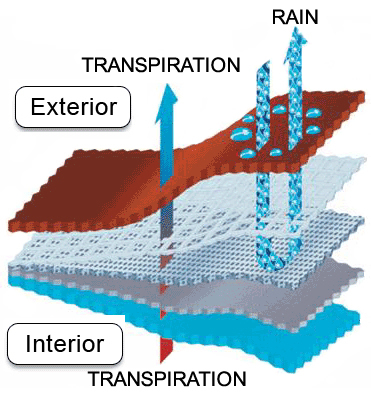 A 3-layer design comprises of a membrane sandwiched between a durable outer layer and an inner layer. This tends to be the most functional construction of rainwear, achieving the highest degree of waterproofing, durability, and breathability. However, they tend to weigh and cost more than other options. A well-fitted hood is paramount to maintaining focus on your activity, so most feature adjusters on the side and back to control the size of the opening. Those jackets without these adjustments are generally meant for more casual use. If you're planning on wearing a helmet while using the jacket, be sure to check that the hood is compatible. Some jackets feature a multitude of pockets to allow quick and easy access to all your equipment, others will have few pockets but have them placed above the hip line to allow for access when carrying bags and some will feature no pockets at all to remain ultra lightweight. Pockets, especially with waterproof zippers, generally increase the price of jackets. Rain jackets must be taped on all seams to be considered waterproof. Zippers can be waterproofed using a storm flap or have a rubberized coating (also called laminated zippers). Coated zippers will have a cover at the top - called a zipper garage or zipper hut - to keep the zipper waterproof. 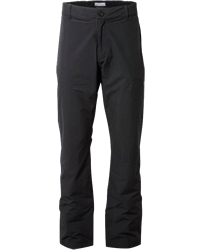 Storm flaps tend to be heavier while coated zippers will be harder to zip up and down and will wear down over time. In addition to the hood adjusters, jackets often have drawcords at the bottom hem, wrist and at the waist in longer jackets. These enable a tight-fit to keep you protected from the wind, water and cold. All rain jackets - even if they are highly breathable - can be overwhelmed by moisture produced during high intensity activity. As a result, some designs integrate zippered armpit vents to allow vapour to escape faster and increase air circulation to help cool the body. Making sure your jacket fits correctly is as important as any of its materials. If it's too big you will be vulnerable to cold and wet through loose fittings, but if it's too small and you'll be unable to accommodate layers underneath the jacket. Dress up in the layers you expect to wear when using the jacket - if it feels tight with a t-shirt on you’ll need to go a size up. Zip up the hood and pull it over your head to check your head and neck movement isn’t restricted. The information in this guide should help you find a rain jacket that keeps you comfortable no matter rain, wind or sweat. This is an investment that will allow you to push on through the harshest conditions or comfort you through winter walks to the pub - choose wisely!